Media Operations Tasks and Responsibilities: Media Operations is responsible for the Command’s media relations activities, including identifying media to engage with to disseminate information, responding to queries, arranging interviews, and advising senior leaders and IJC members on media issues. Media Operations works with local and international media. The staff also manages the IJC media accreditation and embed programs, and works closely with Regional Commands and NATO Training Mission-Afghanistan (NTM-A) Public Affairs staffs. IJC Media Operations distributes, under its letter head, releases from special operations units. Press Releases: Media Operations disseminates news releases regarding current operations as well as command activities of interest to the general public. Joint IJC-Afghan Releases: Media Operations staff should strive to issue joint releases with the Afghan National Security Forces as much as possible; whenever a release involves Afghan National Security Forces — either the Afghan National Army (ANA), Afghan National Police (ANP), National Defense Service (NDS), or all of the above – Media Operations drafts the release as a joint release, with a comment from the Afghan leadership, and coordinates with the appropriate ministries. Media Queries: Media Operations fields and responds to media queries via phone and e-mail. Based on the nature of the query, Media Operations coordinates the response with the PAO Director as required. See Section (__) for examples of when coordination with the PAO Director is needed. All press officers will monitor the Media Office Inbox (unclass), respond to queries, draft press releases, and facilitate media interviews as required. Interviews with IJC Leadership Media Operations coordinates interviews with IJC senior leadership and provides preparatory materials, which may include talking points (NATO, ISAF, etc), information on the reporter (bio and recent articles) for those interviews. Media Operations creates and maintain talking points on a variety of issues. The staff also escorts media to these events and prepares interviewees as necessary. Interviews with Commander, IJC, are referred to the Commander‟s personal PAO for action. Release Authority: The Commander, IJC, is the release authority for media information pertaining to the command and its operations. The IJC PAO Director acts on behalf of the Commander in routine authorization of information. See Appendix A (__) for specific authorities based on type of information being released. Receive info from JOC Watch/RC/Media/Embassy/TF. Check details and confirm with relevant RC/CJOC that info is correct. Post on noticeboard in ISAF Office. Email to MRL distribution list (see previously sent MRLs). 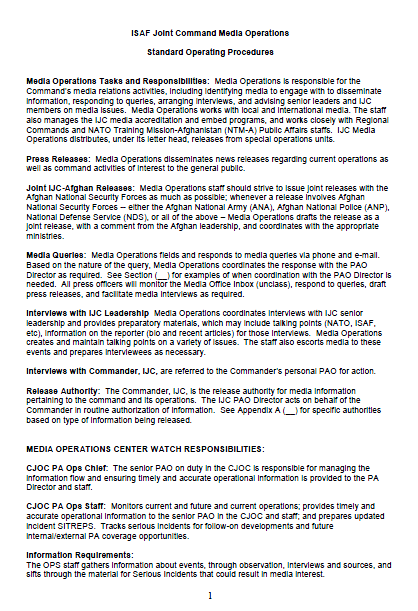 Put relevant info onto ISAF News Release template (unclas) and print original info (original email or detail from RC or original source – should get confirmation from our JOC watch) to go onto back of ISAF sheet for records. FOR ALL CASUALTIES: Include draft sympathy quote for PAO Director or senior PAO on duty. FOR US CASUALTIES: Include acknowledgement line stating the member killed was a US service member. FOR NON-US CASUALTIES: Include statement that ISAF does not release nationality. BEFORE release – check with RC that next of kin have been notified. NO RELEASE will be made until relevant nation has confirmed completed next of kin notification. Ensure quotes, DIVDS reference or other references used are correct. Spell check and once over again. In Press office email send to Distribution Lists 1, 2, 3, 4. Once sent, releases need to be saved into the relevant folder on the P Drive. Feature News Release (General) – good news stories etc. Receive information from RC or particular Unit. Check details and confirm with relevant RC that info is correct. Put relevant info onto ISAF News Release template (unclas) and print original info (original email or detail from RC or original source) to go onto back of ISAF sheet for records. Before being signed off by Media Ops Chief or senior PAO on duty, ensure any quotes, DIVDS reference or other references used are correct. Spellcheck and once over again (always get a second pair of eyes to have a quick read through!). File hard copy with original source and sign off sheet to be put up on wall. Any upcoming events that may be of interest to press need to be „advertised‟. Ensure photos/references etc are correct, ISAF does not mention individual units/nations unless specifically required. Operational Update – This is when there is a change of command as an example and we target the relevant nations (i.e. general release but focus on specific nations that it affects). (1) Death or injuries to ISAF troops – releasable by IJC. (2) Any Civilian Casualty event – releasable by IJC. (3) Catastrophic operational failure (e.g. enemy closure of an airfield) – releasable by IJC. (4) Events with wider intra/inter theatre implications (Elections, NATO policies, TCN policies etc) – releasable by HQ ISAF unless specifically delegated.